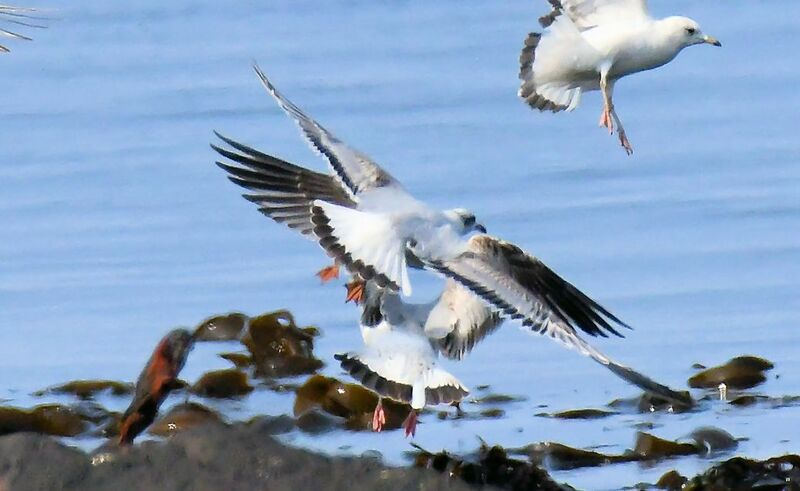 KINTYRE: A 2CY Mediterranean Gull was bird of the day. Also, 50 Ringed Plover, 60 Dunlin, the regular leucistic adult Herring Gull and 4 Sandwich Tern. (Eddie Maguire). MID-ARGYLL: More Swifts around – 2 over Lochgilphead yesterday, and today – 4 over Kilmelford and 9 over Oban. (Jim Dickson). ISLAY: Some records at Loch Indaal from Mike Peacock – Common Scoter 26, Velvet Scoter 1 male, Common Tern 2, Arctic tern 7, Great Northern Diver 5, Red-throated Diver 2. Also a belated report of a Dotterel at RSPB Kinnabus on 2nd May (per SOC ). TIREE: 3CY Iceland Gull at Kenovay, 5 Knot at Loch a’ Phuill – also 1 House Martin there, 5m Ruff at 3 sites,1 Whimbrel at Balevullin, 1 Common Redpoll at the Glebe, 1 Jackdaw, 1f Blackcap and 1 Spotted Flycatcher at Balephuil, 2 Common Tern in with ca 300 Arctic Tern at Milton, 5 Basking Shark off Mannal (John Bowler). 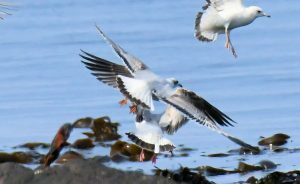 2CY MEDITERRANEAN GULL – MSBO, Kintyre 22nd May (Eddie Maguire).